The Odyssey² sold moderately well in the US. Even without third-party developers, by 1983 over one million Odyssey² units were sold in the US alone. The lack of third-party support kept the number of new games very limited, but the success of the Philips Videopac G7000 overseas led to two other companies producing games for it: Parker Brothers released Popeye, Frogger, Q* Bert and Super Cobra, while Imagic released versions of their hit games Demon Attack and Atlantis. Finally, in 1983 the two Imagic games were brought to the US. 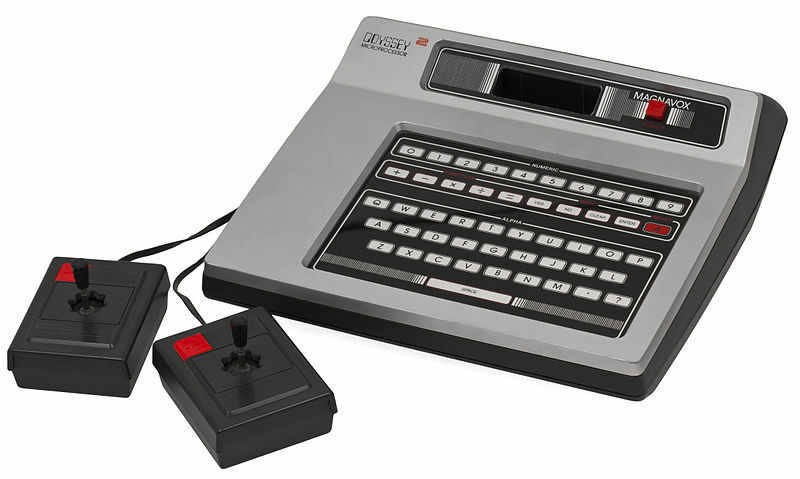 To sell would-be customers on its technical abilities as a computer-based console, the Odyssey² was marketed with phrases such as "The Ultimate Computer Video Game System", "Sync-Sound Action", "True-Reality Synthesization", "On-Screen Digital Readouts" and "a serious educational tool" on the packaging for the console and its game cartridges. All games produced by Magnavox/Philips ended with an exclamation point, such as K.C. Munchkin! and Killer Bees!. If you are a first time visitor to the Odyssey2, be prepared for blocky graphics and simple games. Among the highest rated games for this console are Pick Axe Pete, K.C's Krazy Chase, K. C. Munchkin, Killer Bees, and Smithereens. 4 in 1 Row Alien Invaders - Plus! Alpine Skiing! Attack of the Timelord! Baseball! Blockout! / Breakdown! Dynasty! Electronic Table Soccer! Football! Hockey! / Soccer! Interpol Invaders from Hyperspace! Killer Bees! Las Vegas Blackjack! Loony Balloon! Martian Threat Matchmaker! / Logix! / Buzzword! Math-A-Magic! / Echo! Nimble Numbers Ned Out of This World! / Helicopter Rescue! P.T. Barnum's Acrobats! Pinball Play Tag Pocket Billiards! Secret of the Pharaohs Shark Hunter Showdown in 2100 A.D.! Sid the Spellbinder! Smithereens! Speedway! / Spin-out! / Crypto-logic! Take the Money and Run Thunderball! Turtles! Tutankham Type & Tell UFO! Verkehrsspiele Traffic Games 1 Verkehrsspiele Traffic Games 2 Volleyball! To read the manual for this game, go here . You are a frog. Your task is simple: hop across a busy highway, dodging cars and trucks, until you get the to the top of the screen. On the second screen, you stand at the edge of a river, where you must keep yourself from drowning by crossing safely to your grotto at the top of the screen by leaping across the backs of turtles and logs. But watch out for hungry alligators! In the opening screen – the mists of time, so the rulebook tells us – two players pick their characters’ classes. Warriors are sword-wielding strongmen, wizards can cast spells from a distance, phantoms can walk through solid walls (but not lava formations), and changelings can become invisible when they move. The two intrepid adventurers then set forth on a quest to retrieve the ten rings of power from randomly selected dungeons and filled with randomly selected horrors. To read the manual for this game, go here . An action-adventure game for one or two players, set in a haunted house. Make your way up through the floors, avoiding and/or capturing ghosts, eventually escaping through the attic. Choose zero players for a demo. To view the manual for this game, go here . Armed with a catapult and a seemingly inexhaustible supply of projectiles, your task is to repeatedly and continuously smash your opponent’s castle, his catapult (rendering him harmless for a few seconds), or your opponent himself. Also known as Stone Sling . To read the manual for this game, go here . Get out there and draw! Your cowboy faces off against another player, or the computer, in a fight to see who can draw their gun the fastest – and who can run away the fastest! Also known as Gunfighter . To read the manual for this game, go here . Using the left joystick, you control the movement of your ship within the confines of a screen filled with mines, alien aggressors, and occasional purple “confinement crystals” which you have to catch, because these contain human prisoners of war. The right joystick engages your hyperdrive, enabling you to go zipping along in true Defender style. To view the manual for this game, go here . As Popeye, you’re trying to catch Olive Oyl’s falling hearts before they descend to sea level and are lost, while ducking Bluto’s punches at the same time. A can of spinach appears every so often, giving you the opportunity to read the big bully the riot act (comic strip-style, of course). To read the manual for this game, go here . It’s all the thrills of pinball, minus approximately 75% of the excitement! Use your joystick to control the plunger tension and launch your ball into play. Use the action button to pop the flippers, keeping your ball on the field and out of trouble. The bumpers and spinner score big points… well, relatively speaking. Also known as Flipper Game . To read the manual for this game, go here . Classic pigskin comes to sluggish life in this over-complicated video game edition. Despite the Odyssey’s full keyboard, the game forces players to look up plays in the manual and execute them with joystick commands. After that, aside from some minimal control of whoever has the ball, it’s a bit like watching an ant farm. Also known as American Football . To read the manual for this game, go here . In Baseball!, you are, quite simply, one of two teams playing the great American game. If you’re up at bat, your joystick and button control the man at the plate and any players on base. If you’re pitching, your button and joystick control how wild or straight your pitches are, and you also control the outfielders – you can catch a ball on the fly, or pick it up and try to catch the other player away from his bases. In Tutankham , the player takes on the role of an explorer who is searching through a maze-like Egyptian tomb, hunting treasures while fighting off various enemy creatures. To read the manual for this game, go here . The constant struggle between cat and dog requires a great deal of concentration. Two players can play, or one player can control the dog while the CPU makes moves as the “Microcat.” Each animal drops a piece into the playing field, trying to line up four pieces horizontally, vertically or diagonally, or trying to keep the other animal from lining up his four pieces. Whoever lines up four pieces first wins the game. To view the manual for this game, go here . An elaborate game of tag, only the simian players have an advantage; human players, when tagged, must be “un-tagged” by the other player to return to the game. To read the manual for this game, go here . Hostile spacecraft are bombing the underwater paradise of Atlantis from above. Manning two cannons, you can knock the attacking ships out of the sky – or try to hit them at close range if they dive to bombing altitutde. When all of Atlantis’ landmarks have been wiped out, the game is over. You type! It talks! And occasionally you have to throw the damnedest misspellings at it to get it to say the simplest words. And despite the back of the box claiming that it “plays fun games,” it’s much more likely that it’ll just make some fun (and weird) sounds. To view the manual for this game, go here . This authentic electronic simulation of world class championship skiing is so realistic you can hear your skis cut through the powder as you traverse the slopes! It's all here! The Slalom - the Giant Slalom - and the soaring downhill races! It's you against other skiiers and a computerized timer that clocks you to 1/10th of a second! The excitement is endless - the computer generates over 195,000 different runs! Also known as Skiing . Red Baron (19xx)(-)(EU) An unreleased prototype of a cockpit-view air battle game. Precious little information is available. To read the manual for this game, go here . Hockey! : Realistic speed skating and fast off-the-wall action on electronic ice! Soccer! : A computerized version of the fastest growing college sport in the U.S. Also known as Electronic Ice Hockey / Electronic Soccer . In probably the weakest of the Master Series games – Odyssey games which included overcomplicated board game elements, a la Quest For The Rings – you control one of the world’s superpowers, attempting to gain as much influence as possible through political and economic means and, where necessary, warfare. To read the manual for this game, go here . Computer Intro contains a programming environment that lets users enter and run their own programs with up to 100 lines of code. Use Computer Intro along with its 107 page manual to learn the fundamentals of assembler and machine language programming. Also known as Computer Programmer . Play the classic game of Chess on the Odyssey 2. Since the Odyssey 2 didn't have enough RAM and computing power for a chess program, Philips shipped this cartridge with an add-on computer module that sits on top of the Odyssey 2. The Internet Archive has a copy of the service manual for this module . To read the manual for this game, go here . A computerized tournament soccer table—complete with invisible electronic lightning rods for super fast play action! Also known as Electronic Table Football . Two keyboard overlays are available for this game: One here and another here . To view the manual for this game, go here . To read the manual for this game, go here . Place your bets, ditch some cards, or play with the ones you’ve got. The computer offers the usual enticements – double down and insurance – but the odds are firmly in favor of the house. There’s no limit on how big your bet is, so you’re even free to bet an ante that’ll have you screaming “uncle!” if you lose. Also known as Blackjack . To read the manual for this game, go here . You pays your money, you takes your chances. Pull the lever (or, in this case, the joystick) and try to get the fruit to line up. If you succeed, you’re in good shape; if you don’t, well, you’re out some more change. Also known as Las Vegas . European release of Showdown in 2100 A.D.! Get out there and draw! Your cowboy faces off against another player, or the computer, in a fight to see who can draw their gun the fastest – and who can run away the fastest! To read the manual for this game, go here . The object of Neutron Star is to save two rows of "satellites" or "space stations" from meteorites by either blasting them (which yields no points) or grabbing them and dropping them into a very nearby neutron star, which is actually a singularity (better known as a "black hole"). Nimble Numbers Ned (1978)(Philips)(US) Guide our red and white hero through a series of educational minigames. When the game asks you "WHICH DRILL?" press the number for the appropriate minigame: 0: JUMPING PRACTICE - Jump over rolling barrels! 1: NAME THE SHAPES - Score points by answering questions about shapes. Then jump over barrels. 2: MULTIPLICATION RUNTHROUGH - Solve multiplication problems. Then, more barrel-jumping. 3: FUNCTION MACHINE - Algebra puzzles! Followed by barrels! To read the manual for this game, go here . An electronic simulation so real you can even spike a shot! Also known as Electronic Volleyball . To read the manual for this game, go here . To view the manual for this game, go here . Purporting to be based on the ancient Chinese game of Go, Dynasty! is actually more of a variation of Othello. The same strategies apply, and can be played with two players, one against the computer, or – for those who are feeling a little bit lazy – the computer vs. itself. Also known as Samurai . To view the manual for this game, go here . A one player maze game published and developed by Philips in 1983. To read the manual for this game, go here . Math-A-Magic! is essentially electronic flash cards, while Echo! is a slightly watered down version of the classic electronic game Simon . Also known as Mathematician / Echo . To read the manual for this game, go here . This cart has two minigames: "The Juggler" - A chap wandering along the bottom of the screen must catch balls descending from a maze. Involves no actual juggling. "Tic-Tac-Toe" (lit. "Old Woman's Game") - A two-player version of the classic. To read the manual for this game, go here . Interpol is a game for two players, one controls two spies (red characters) and the other controls two police officers (blue characters). The spies are in possession of secret information and must try to leave the country with them, by air or by sea. The police officers have to stop their plan. The airport and the port are blocked by the police, and individuals interested in traveling must present a code which only the police knows.